As the weather cools, our drive to escape the dull of everyday life ignites, frequently leading us on a hunt for the next staycay, vaycay or mini-getaway in and within driving distance of Brisbane (we catch feelings, not flights). A few hot chocolates and successful endeavours of web surfing later, we’ve compiled a list of gorgeous hotels, wineries and glamping hotspots that you need in your life. We’ll warm up the car. Gorgeous by name and nature, Halcyon House provides a balmy beachside escape you’ll find glistening in Condé Nast’s Gold List of 2019’s best hotels in the world. With each room having been individually designed by Anna Spiro, the art deco hotel provides guests with an equally unforgettable and unique experience of comfort, colour and contemporary style (we’re a little obsessed with the fabric upholstered walls and private terraces). Besides exploring Cabarita Beach and trekking through the beautiful surrounds, days spent at your home away from home will be just as magical (if not more). Halcyon Spa and Boutique will soothe your soul from the very first session in the bespoke steam room to the last fragrant facial. Once you’ve reached peak zen, dine at on-site restaurant Paper Daisy with chef Jason Barratt at the helm of incredible breakfasts, lunches and dinners. Our bodies are ready. Book your stay here. If camping does not spark joy, glamping definitely will. For lovers of the outdoors that are also creatures of comfort, Nightfall is everything you never knew you needed. In between hiking through Lamington National Park, searching for hidden waterfalls and getting a massage over a freaking creek (see here), you’ll be able to kick back in a glamorous safari tent with a shower, bed, fireplace and more. Find out everything you need to know here. Staycations are never a bad idea, especially when you’re somewhere as magical as The Calile. Don’t freak out now, entering the venue will not exude Brisbane vibes. At all. Rather, this coastal space with poolside tables, palm trees and contemporary concrete and pastels will let you feel worlds away, with on-site restaurant Hellenika serving traditional Greek dishes with modern twists. The rooms are complete with robes and Insta-worthy spaces around every turn, offering a slice of luxury in the Valley like none other. Located in James Street, you have a street’s worth of boujie shopping ahead of you, with plenty of cocktail hotspots nearby. Stunning. Wine and floating pavilions? That’s a devilishly delicious kind of sanctuary. Sirromet Wines’ signature accomodation is the perfect place to stay if being the designated driver to your favourite winery doesn’t cut it for anyone (and as if it would). After a cheeky bit of wine tasting and working your way through three on-site eateries, you’ll be able to crawl back into bed and gaze out across the tree canopy over the lagoon. Each pavilion is raised for a sort of treehouse experience that won’t freak out those with a fear of heights, with a balcony perfect for enjoying a bottle (or two) of wine picked up from the cellar door. We’ll drink to that. 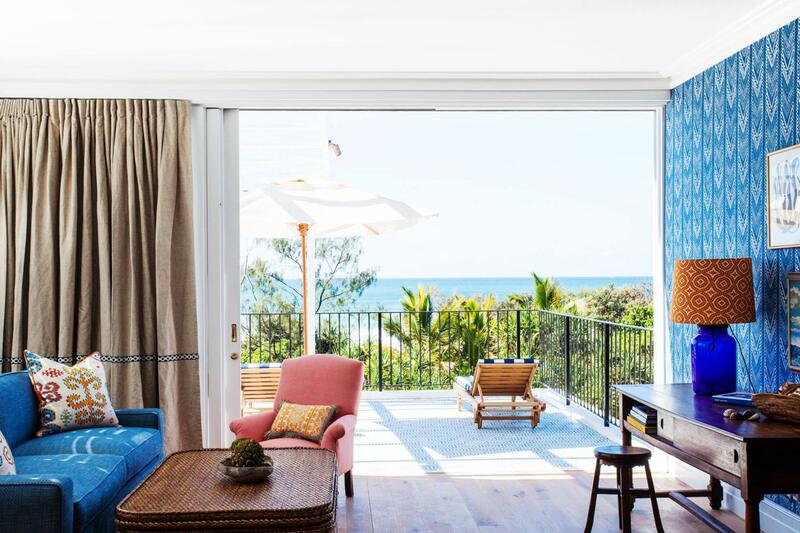 Move your Mediterranean dream holiday to Byron Bay, because Raes on Wategos pays true homage to the region across every nook of the hotel. Stunning colourful stone detailing is worked around pristine white walls, creating an aesthetically pleasing space you’ll never want to leave. After getting your tourist on with trips to Stone & Wood’s core brewery and the iconic Byron Bay Lighthouse, head back to Raes for a tranquil spa experience and eats in the dining room, with appropriately Mediterranean-inspired dishes. Get out of my dreams, get into my annual leave.